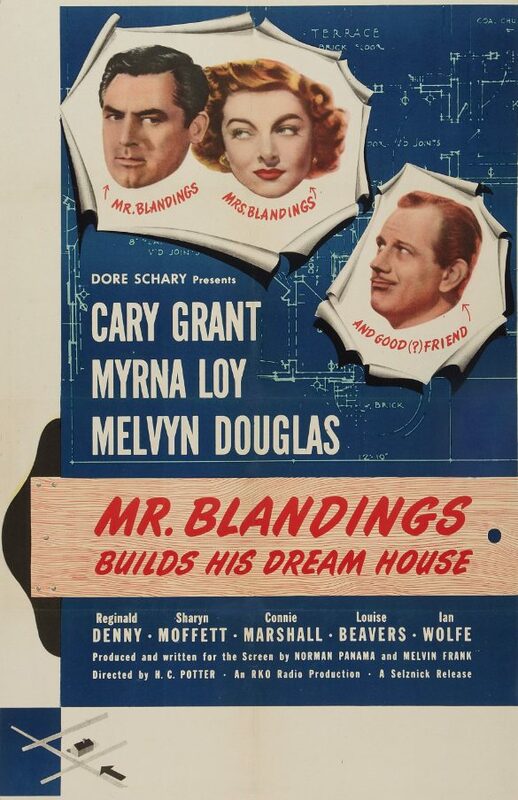 I don’t know about you, but comedies like H.C. Potter’s Mr. Blandings Builds His Dream House really stress me out. When the subject of “things I could never laugh at” comes up, most people think of things like the death of a beloved family pet or ethnic cleansing, but while I don’t find either of those subjects fertile ground for comedy, one subject stands above all others as something I can never laugh at — chasing good money after bad. I don’t know if Mr. Blandings Builds His Dream House is the first comedy in which most of the “comedy” involves someone making terrible decision after terrible decision and throwing vast sums of money into a disastrous project, but it’s one of the best-known and most well-loved. The first movie like this I saw was the 1986 Tom Hanks “comedy” The Money Pit, which even as a kid I found stressful and unfunny. The second was the Joe McDoakes “comedy” short So You Want to Move (1950), in which every bad decision the main character makes and every accident he has is flashed on screen in dollar amounts. As the one-reeler continues, and he drops things and crashes into things, his financial responsibility grows and grows. As an argument for using professional movers, So You Want to Move is a persuasive infomercial, but as a comedy it’s totally devoid of laughs. At least for me. At least Mr. Blandings Builds His Dream House is enjoyable in the early going, and stars Cary Grant and Myrna Loy, who previously starred together in Wings in the Dark (1935) and The Bachelor and the Bobby-Soxer (1947), and who are both attractive, charming, and a lot of fun to watch. Grant plays Jim Blandings, a college graduate who lives in Manhattan, works in advertising, and makes about $15,000 a year. 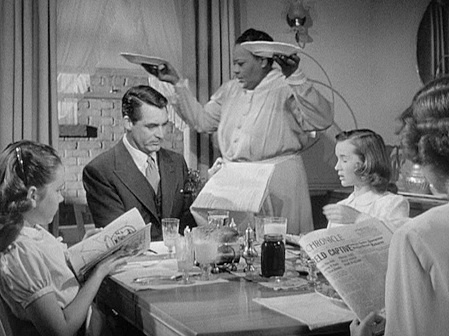 We learn all this from the film’s omniscient narrator, who also calls Mr. Blandings a “modern-day cliff dweller,” since he lives in a high-rise apartment building with his beautiful wife Muriel (Myrna Loy), their two daughters, and their housekeeper Gussie (Louise Beavers). Here’s a case where inflation doesn’t tell you everything, since $15,000 is roughly $145,000 in 2012 dollars, but I don’t think even that salary today would be nearly enough to support a wife who doesn’t work, two kids in private school, and a Manhattan apartment big enough to fit a family and a live-in servant. Granted, the Blandings live in cramped quarters. Everything in their apartment is full to bursting and ready to explode like Fibber McGee’s hall closet, and as the narrator tells us, “just getting shaved in the morning entitles a man to the Purple Heart.” But that’s just Manhattan living, folks. Even for the relatively well-to-do. I can’t even talk about what happens next. It’s just too painful. Posted in 1948, June 1948 and tagged Cary Grant, Comedy, Dore Schary, H.C. Potter, Louise Beavers, Melvyn Douglas, Myrna Loy, RKO Radio Pictures. Bookmark the permalink. During World War II, director George Stevens served as a Lieutenant Colonel in charge of combat photography. He filmed D-Day, the Battle of the Bulge, the liberation of Paris, and the horrors of the concentration camps. When he returned home to America he started a production company, Liberty Films, with William Wyler and Frank Capra. For his first film, Stevens chose to look back to the time and place of his own boyhood — early 20th-century California — rather than the uncertain post-war future. I Remember Mama is the story of a Norwegian immigrant family living in San Francisco. It’s based on the 1944 play by John Van Druten, which was adapted from Kathryn Forbes’s book Mama’s Bank Account, which was published in 1943. Dear George: Without exception I think “I Remember Mama” is the most perfect picture that Ive [sic] seen in years. Direction was magnificent and I think all of us can learn [a] great lesson from it. My deepest admiration goes to you and everyone who had any part in this production. Warmest regards. Mike Curtiz. While I wouldn’t go so far as to say that I Remember Mama is the most perfect film I’ve seen in years, it’s a wonderful movie that’s heart-warming without being saccharine and that’s beautifully acted and filmed, much of it on location in San Francisco. Of course, Stevens had the benefit of wonderful source material. 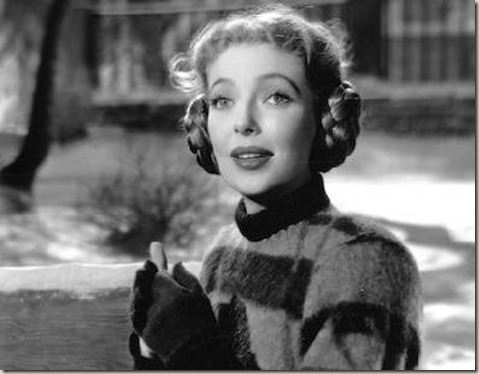 I’ve never seen the play by John Van Druten that the film is based on, but I read Kathryn Forbes’s Mama’s Bank Account in sixth grade, and so much about it has stayed with me. It’s warm, humorous, and there’s pure magic in its evocation of ordinary life. 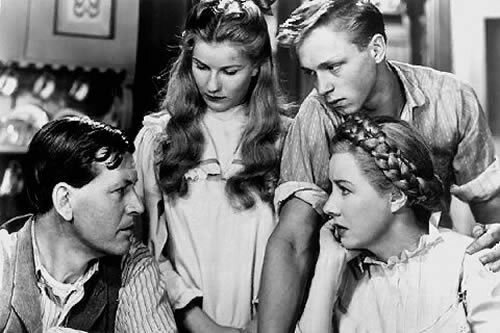 Barbara Bel Geddes plays Katrin, the young writer who finds her subject when she decides to write about her mother, and she sometimes addresses the camera directly. Irene Dunne plays “Mama” (we never learn her real name, which is as it should be). Like the book, the film is a series of vignettes. There is the tale of the family’s roomer, Mr. Hyde (Cedric Hardwicke), whom Mama’s sisters warn her might be putting something over on her when he’s always late with the rent, but Mama doesn’t mind so much, because Mr. Hyde reads to the family every night from the classics — A Tale of Two Cities, The Hound of the Baskervilles, and Hamlet. Like most of the stories that comprise I Remember Mama, the tale of Mr. Hyde has a bittersweet end, but it’s more sweet than bitter, since his enthralling nightly storytelling sessions kept Katrin’s brother Nels (Steve Brown) off the street the night his friends were arrested for breaking into a shop, and were Katrin’s inspiration to become a writer. My favorite vignette from both the book and the movie is about Katrin’s Uncle Chris (Oskar Homolka), with his loud voice and his fierce black mustache, who would come down from his ranch in the north and descend upon San Francisco in his automobile, charging up Market Street with ferocious speed, compensating, perhaps, for the limp he still carries from a childhood accident. When Katrin writes a story about her uncle Chris, her teacher scolds her and tells her it’s not nice to write that kind of story about a family member. 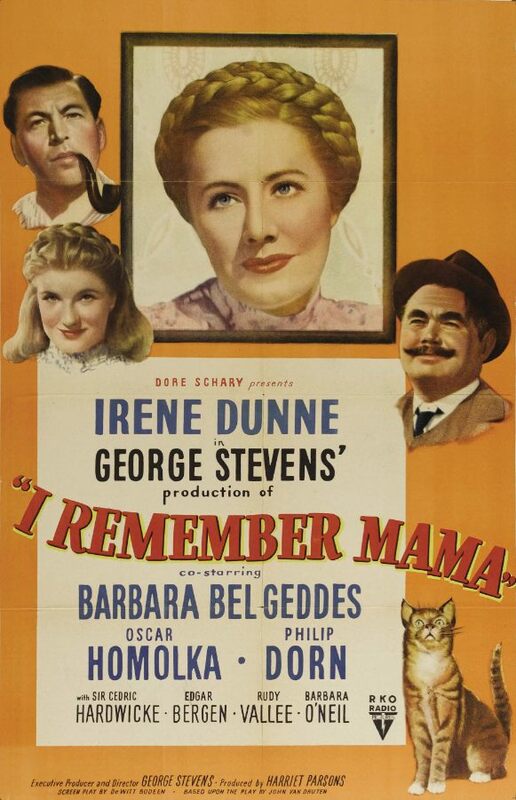 I Remember Mama was nominated for a bunch of Academy Awards, but it didn’t win any — Best Actress (Irene Dunne), Best Supporting Actor (Oskar Homolka), Best Supporting Actress (Barbara Bel Geddes), Best Supporting Actress (Ellen Corby), and Best Cinematography, Black and White (Nicholas Musuraca). 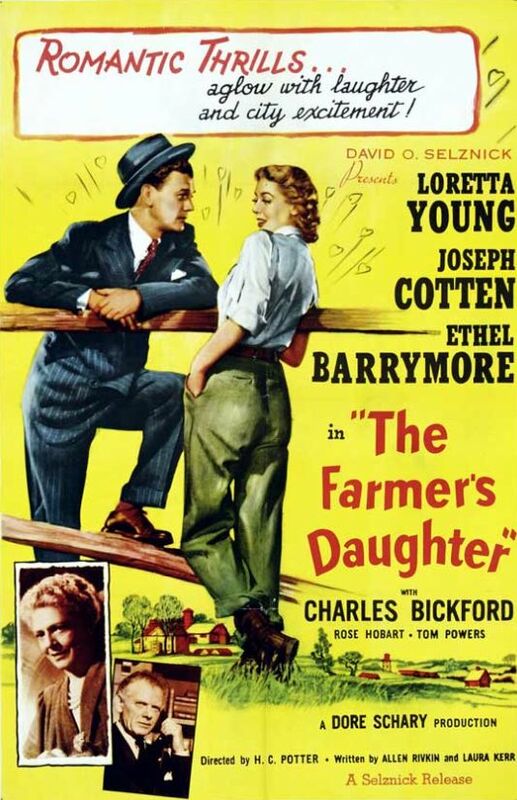 Posted in 1948, March 1948 and tagged Barbara Bel Geddes, Dore Schary, Drama, Family Films, George Stevens, Irene Dunne, john van druten, kathryn forbes, Liberty Films, Oskar Homolka, Philip Dorn, RKO Radio Pictures. Bookmark the permalink. Robert Siodmak’s The Spiral Staircase was made in 1945, and released into some theaters in December. The earliest confirmed day of release I could find, however, was February 6, 1946, in New York City, so I’m reviewing it here. Based on Ethel Lina White’s 1933 novel Some Must Watch, The Spiral Staircase is a slick, good-looking thriller with some striking visual choices. White’s novel took place in contemporary England, but the film is set in early 20th century Massachusetts. Some sources I’ve found claim it takes place circa 1916, but the silent film an audience in a movie house is watching in the first scene of the film is D.W. Griffith’s 1912 short The Sands of Dee, and one of the characters has just returned from Paris, about which he waxes rhapsodic, speaking wistfully of all the beautiful women. So it seems to me that the action of the film must take place before the First World War. The Spiral Staircase doesn’t take long to deliver its terrifying goods. In one of the rooms above the silent movie house, we see a young woman (Myrna Dell) getting undressed. She walks with a slight limp. When the camera moves into her closet as she hangs up her dress, there is a pause, then the camera moves into the thicket of hanging clothes. They part slightly, and suddenly we see an enormous, maniacal eye fill the screen. We then see the girl reflected in the eye, her lower half blurred (why this is will be explained later). Alfred Hitchcock used a closeup of Anthony Perkin’s eye to great effect in Psycho (1960). And one of the earliest indelible images in the history of cinema was an eyeball being slit open by a straight razor in Luis Buñuel’s short film Un chien andalou (1929). But a close shot of an eye used in the same way as a violin stab on the soundtrack, or a shadow quickly passing across the frame, to make the audience jump out of their seats, is relatively rare. I thought Bob Clark’s Black Christmas (1974) was the first film to do this — when the killer is shockingly revealed as an eyeball peering out from between an open door and a door jamb — but apparently it wasn’t. Among the patrons of the movie house, none of whom is questioned by the incompetent local constable (James Bell) after the murder, is a mute woman named Helen Capel (Dorothy McGuire). Her friend, the handsome young Dr. Parry (Kent Smith), gives her a ride home, and tells her that he believes her muteness can be overcome. She silently demurs, and goes home to the creepy old mansion where she is employed as a servant to the bedridden but mentally sharp Mrs. Warren (Ethel Barrymore). Also present in the house are the other domestics, Mr. and Mrs. Oates (Rhys Williams and Elsa Lanchester, who looks a lot frumpier than when she played The Bride of Frankenstein in 1935), Mrs. Warren’s two stepsons, Prof. Albert Warren (George Brent) and ne’er-do-well Steve Warren (Gordon Oliver), the professor’s pretty assistant Blanche (Rhonda Fleming), and Mrs. Warren’s crotchety old nurse (Sarah Allgood). The film is never boring, however, due in no small part to the brilliant cinematography of Nicholas Musuraca. 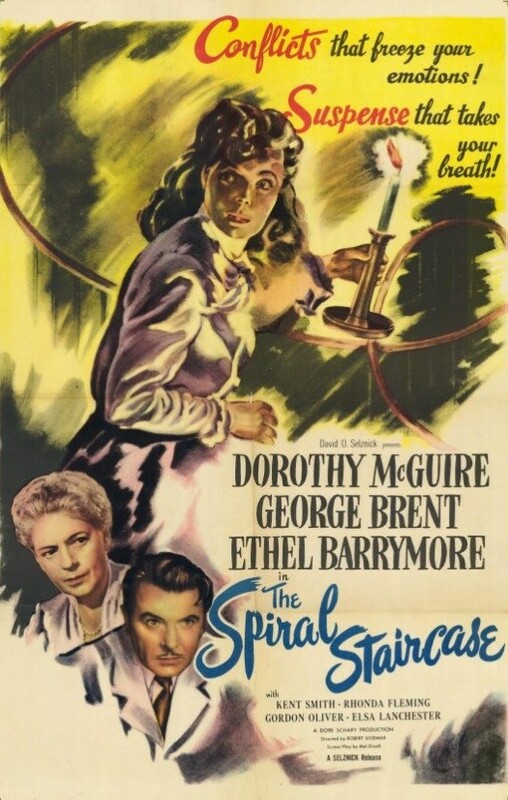 The Spiral Staircase is all shadows and gaslight, which — along with one of the longest thunderstorms on film — hearkens back to spooky haunted house pictures like James Whale’s The Old Dark House (1932). The Spiral Staircase is not quite a masterpiece, and it never aspires to be more than a pulse-quickening thriller, but it is exceptionally well-made entertainment. Posted in 1945, 1946, December 1945, February 1946, January 1946 and tagged Charles Wagenheim, Constantin Bakaleinikoff, Dore Schary, Dore Schary Productions, Dorothy McGuire, Ellen Corby, Elsa Lanchester, Erville Alderson, Ethel Barrymore, Ethel Lina White, George Brent, George Holmes, Gordon Oliver, Harry Marker, Harry W. Gerstad, Horror, James Bell, Kent Smith, Mel Dinelli, Myrna Dell, Mystery, Nicholas Musuraca, Rhonda Fleming, Rhys Williams, Richard Tyler, RKO Radio Pictures, Robert Siodmak, Roy Webb, Samuel Hoffman, Sara Allgood, The Spiral Staircase, Vanguard Films. Bookmark the permalink.